Greenmark Environmental is ready to provide you with Landscape Design Services and become your preferred Sugar Land Landscaper. Residential irrigation systems are also our specialty and we are glad to offer sprinkler systems for commercial properties in Fort Bend County. Sugar Land residents should trust their Lawn Care needs to Greenmark Environmental, as we stand as the best Sugar Land Lawn Care Company . Richmond TX businesses trust Greenmark Environmental on a weekly basis to provide them with affordable landscaping services. 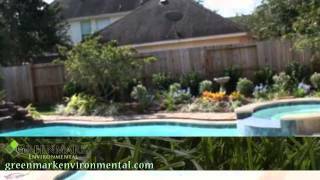 Greenmark Environmental is the choice Richmond TX Landscape service company. Homeowners in Missouri City TX call us regularly to provide them with the best landscape design services. The best choice for Missouri City Landscape Design company is Greenmark Environmental. Rosenberg TX is a popular area for using our custom irrigation services. Look no further than Greenmark Environmental for the best Rosenberg TX Irrigation Services company. Commercial Landscape Services are very popular in Stafford TX amongst the many commercial offices, warehouses and manufacturing facilities. No other Stafford TX commercial landscape services company can offer you the level of services and quality of lawn care for your Stafford TX property than Greenmark Environmental. Fulshear TX has many homeowners who use our garden design services. Greenmark is synonymous in the city of Fulshear, TX with the very best garden design. If you have property in Sugar Land TX, Richmond TX, Fulshear TX, Rosenberg TX, Stafford TX, or Missouri City TX and are looking for a Richmond TX Landscape maintenance company, or in need of regular landscape maintenance or custom irrigation services, or perhaps you own a home or a commercial property and need landscape design services, our garden design specialists can offer you the best landscape design, landscape maintenance plan, and irrigation service plan. We welcome the opportunity to meet with you to discuss your landscape needs. Call or email to schedule an appointment. Proudly serving the Houston Metro Area and Greater Fort Bend County including Richmond, Rosenberg, Sugar Land, Katy, Fulshear, Stafford, Missouri City, Memorial, Cypress and Pearland. Greenmark Environmental is a family owned and operated full service landscaping company located in Fort Bend County with over 30 years of experience in the green industry. Greenmark is proud to offer commercial landscape maintenance services and irrigation services homeowners, apartment communities, homeowners associations, private corporations, government agencies and municipalities. Greenmark Environmental is an elite Lawn care, Landscape maintenance, Irrigation services, Landscape Design, Commercial Landscape Services, and Garden Design company based in Rosenberg TX serving Sugar Land TX, Richmond TX, Rosenberg TX, Stafford TX, Missouri City TX, Houston TX, Fulshear TX, Katy TX, Fort Bend County, Harris County. Greenmark has provided Landscaping services for more than 20 years to the following Zip Codes - 77406, 77407, 77469, 77471, 77477, 77478, 77479, 77498, 77497, 77496, 77487, 77449, 77450, 77491, 77492, 77493, 77494, 77441, 77489, 77459, 77004, 77005, 77008, 77009, 77010, 77015, 77016, 77017, 77022, 77023, 77001, 77002, 77003, 77006, 77007, 77011, 77012, 77013, 77014, 77018, 77019, 77020, 77021, 77024, 77025, 77026, 77027, 77028, 77031, 77032, 77033, 77029, 77030, 77034, 77035, 77036, 77037, 77038, 77039, 77041, 77045, 77046, 77047, 77052, 77053, 77054, 77058, 77040, 77042, 77043, 77044, 77048, 77049, 77050, 77051, 77055, 77056, 77057, 77059, 77060, 77061, 77062, 77065, 77066, 77067, 77068, 77069, 77070, 77075, 77076, 77077, 77078, 77063, 77064, 77071, 77072, 77073, 77074, 77079, 77080, 77081, 77085, 77086, 77087, 77088, 77093, 77094, 77095, 77096, 77203, 77204, 77205, 77206, 77212, 77213, 77215, 77216, 77221, 77222, 77223, 77224, 77082, 77083, 77084, 77089, 77090,77091, 77092, 77098, 77099, 77201, 77202, 77207, 77208, 77209, 77210, 77217, 77218, 77219, 77220, 77225, 77226, 77227, 77228, 77229, 77235, 77236, 77237, 77238, 77240, 77248, 77249, 77251, 77252, 77253, 77230, 77231, 77233, 77234, 77241, 77242, 77243, 77244, 77245, 77254, 77255, 77256, 77257, 77258, 77265, 77266, 77267, 77268, 77269, 77275, 77277, 77279, 77280, 77290, 77291, 77292, 77293, 77297, 77259, 77261, 77262, 77263, 77270, 77271, 77272, 77273, 77274, 77282, 77284, 77287, 77288, 77289, 77299.